I'm really excited about this book. For all of you that will be reading it with me I decided that it would be best to start this week off by reading chapters 1 & 2. This is pretty much just the intro. It talks about what we will be learning in the book. Next Monday we will discuss what we read and then start the fun stuff! Next week we can begin doing the tasks that will help us with our weight loss journey. I really can't wait. I think these tasks are really going to help us to see things differently. I hope you will all join me in reading this book. 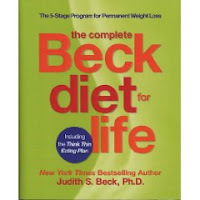 It really seems like a neat book with tons of good ideas to help us learn new ways to overcome many challenging situations and pitfalls that we come across when trying to lose weight. Click here for more info on what we will be doing with this book.